Proposed C. destructans life cycle. Host mitchondria is brown. Image credit. What do you call a small bacterium that acts like a virus, infecting and lysing eukaryotic cells? Chromulinavvorax destructans, of course! As part of a study to identify pathogens that infect protist zooplankton, particles smaller than 0.8 microns were obtained from freshwater habitats in southwestern British Columbia, and used to infect cultures of protists. This hunt yielded a pathogen that infects Spumella elongata, one of Earth’s most abundant phagotropic nanoflagellates. These flagellated eukaryotes are 2-20 microns in size (=nano) and prey on bacteria, viruses, and other microbial eukaryotes. Spumella is found in both fresh and salt water. The lytic agent was called Chromulinavorax destructans. The cells of C. destructans are 350-400 nm cocci with a double lipid layer and an electron dense nucleoid. The particles have a homogenous DNA staining profile suggesting that replication does not occur outside of the host. 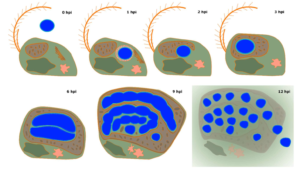 The life cycle of C. destructans begins when the cell is taken up by the phagotropic host in a food vacuole. By 3 hr the mitochondria is partially wrapped around it! Eventually (9 hr) the mitochondria, which remain intact, completely surround the replication body. By 12 h the mitochondrion occupies 2/3 of the host cytoplasm. Infected cells developed large DNA-containing cytoplasmic compartments starting at 8 hr post-infection. These divide into mature cocci followed by lysis of the host starting at 18 hpi, liberating new C. destructans. Analysis of the 1,174,272 bp circular dsDNA genome of C. destructans reveals why the bacterium is highly dependent upon its host. It encodes 1,081 open reading frames, including proteins involved in DNA replication, translation, trans-membrane transporters and host manipulation; some but not all of the ribosome; all 20 aa tRNAs, and a DNA replication and repair machinery. But the genome of C. destructans encodes not a single complete metabolic pathway. Precursor nucleosides must be imported from the host, and amino-acid biosynthesis is restricted to simple conversions between related amino acids. The genome encodes many transporters to import peptides, amino acids, lipids, trace elements (iron, zinc, etc) from the host. For example, an ATP/ADP antiporter allows for the exchange of ADP for ATP from the host. The ATP presumably comes from the expanded mitochondrion, wrapped around the replication body. A rudimentary cell division machinery is present, a complete pathway of peptidoglycan synthesis, but no genes for lipid or LPS biosynthesis. There are many genes encoding proteases, nucleases, and hydrolases, which are probably involved in processing and breaking down the host cell for use by C. destructans. C. destructans is a member of the candidate phylum TM6, also known as the Dependentiae. That these bacteria are parasitic is inferred from analysis of genomes identified in metagenomic studies, and from the study of two isolates that infect amoebae. C. destructans is the first member of this group that does not infect an amoeba. The lifestyle of C. destructans , infecting a host, replicating, and lysing the cell, raises the question: is it a bacterium or a virus? A key component of the definition of a virus is that it does not replicate by binary fission, but by assembly of components to form new virus particles. Hence, D. destructans is a bacterium, but it might be on the way to being viral.